Spike Lee went on an anti-gentrification rant at Pratt Institute on Tuesday night. FORT GREENE — Spike Lee laced into an audience member at Pratt Institute Tuesday night for asking about the "good side" of gentrification, according to reports. “Let me just kill you right now,” he said, beginning a 7-minute tirade on the changes to his home neighborhood of Fort Greene, New York Magazine first reported. 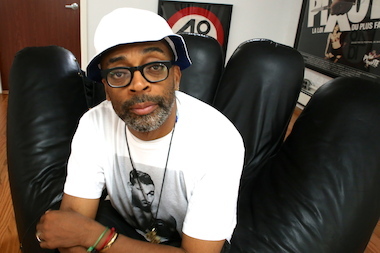 Here is the full audio of Spike Lee's speech. WARNING: This recording contains graphic language. "Have you seen Fort Greene Park in the morning?," Lee asked. "It’s like the motherf---in’ Westminster Dog Show." Lee — who currently lives on the Upper East Side in a multimillion-dollar mansion — was speaking at the art school in honor of African American History Month when the issue of gentrification was raised, according to reports. "Here’s the thing: I grew up here in Fort Greene. I grew up here in New York. It’s changed," he said. "And why does it take an influx of white New Yorkers in the South Bronx, in Harlem, in Bed Stuy, in Crown Heights for the facilities to get better?" The "Do The Right Thing" creator, who has been outspoken against gentrification, also reportedly railed against the neighborhood's skyrocketing rents, private school admissions, police presence and real estate brokers who change the names of neighborhoods to make them sound more appealing. "You can’t just come in when people have a culture that’s been laid down for generations and you come in and now s--t gotta change because you’re here?" Lee said. "Get the f--k outta here," he added. "Can’t do that!"